If you are about to redesign your website, now is a good time to focus on getting a website that can be used by as many people as possible. Here are some tips on when and how to make requirements and focus on accessibility throughout the redesign process. Developer's field for description of solution: Leave blank for developer to fill out. Do the same for all the criteria. You can also state, if a criteria is an ultimate requirement or a desirable requirement. Consider also your organization's design manual and if there are any contradictions with the accessibility guidelines. For example there are specific accessibility guidelines on the contrast ratio between background and text colors. For this reason it is important to use 'accessible' color combinations. A handful of the accessibility criteria are relevant when starting the phase of designing and doing wire frames. Think about navigation, the use of headings, colors, link texts and descriptions in places where the user is supposed to click, fill out, or choose content. When it comes to the process of development, most of the accessibility criteria are relevant. Therefore it is important that the people developing the solution have a solid understanding of accessibility. Make sure you test the solution during the process from start to finish. Do not wait until the acceptance test. By then it's nearly impossible task to correct possible errors and shortcomings before the site goes live. It's especially important that the templates for different pages are tested as early as possible before building on them, to avoid spreading mistakes to hundreds or thousands of pages. Make sure you train web editors on how to publish content the 'accessible way'. This way, when content is added both in the development phase and after you've launched, it furthers your site's accessibility rather than introducing new accessibility issues. Areas often being neglected include integrations with third party solutions, such as media players and forms. Remember these in the process. They should also be accessible! Also think about content being migrated from the old system into the new. The WCAG specifications differ between HTML/XHTML versions. There might also be content from the old system that is not accessible. After all your hard work, the last thing you want is to carry old problems over to your new website. 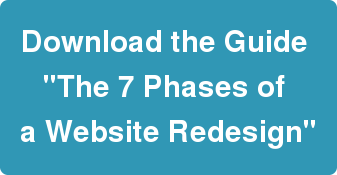 To learn about all the aspects of the redesign process, download the guide "The 7 Phases of a Website Redesign". Blog post: Use Analytics Data when Planning Your New Website.